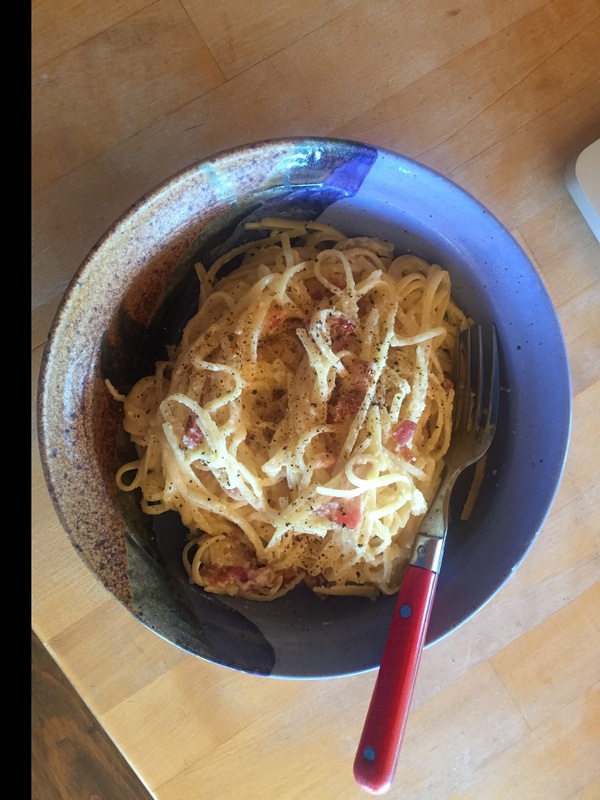 This probably spells trouble: Made spaghetti carbonara for breakfast for the third time this week, although Day 2 was with smoked salmon instead of bacon. Heavenly is the word that comes to mind, partly because it goes down so easy. The eggs, bacon fat, parmesan and pasta water make for the creaminess. And because it is creamy, you need to be careful to keep the pasta firm. I console myself with the fact that it is a “peasant dish.” The ingredients are common and cheap. I suppose I could improve by using pancetta, but a little plain old American bacon works fine for me. As with pinto beans, the trick is to not use too much. I use thick-cut bacon, and just a little of the fat and smokiness go a long way. Even so, when craving pasta, I probably should switch to my other favorite — primavera — soon. The fat and calorie count would be much lower, I’m sure. It’s just not as good for breakfast. Meanwhile, as the carbs soothe my brain, I wonder if a chuckwagon cook could get away with whipping up pasta carbonara in the morning instead of the usual biscuits and stuff?